13 gang members were indicted on Monday for participating in a gang and for the murder of Sebastian Dvorak, a man killed while walking in Canton. Clinton Davis, 36; Joseph Flowers, 38; Duwarn Holt, 29; Markeece Jordan, 25; Robert Lewis, 38; Malik Mungo, 18; Vernon Miller, 29; Dante Neal, 21; Gregory Randle, 34; Harvey Turner, 28; Keith Worthington, 33; Lienell Young, 33; and Timothy Zeller, 36 were all allegedly involved in the gang known as '500' or '500 L'. They are known in Maryland, including the 500 block of North Rose Street in Baltimore, and are a subset of the Bloods gang. They also feature members who are not sworn members of the Bloods. 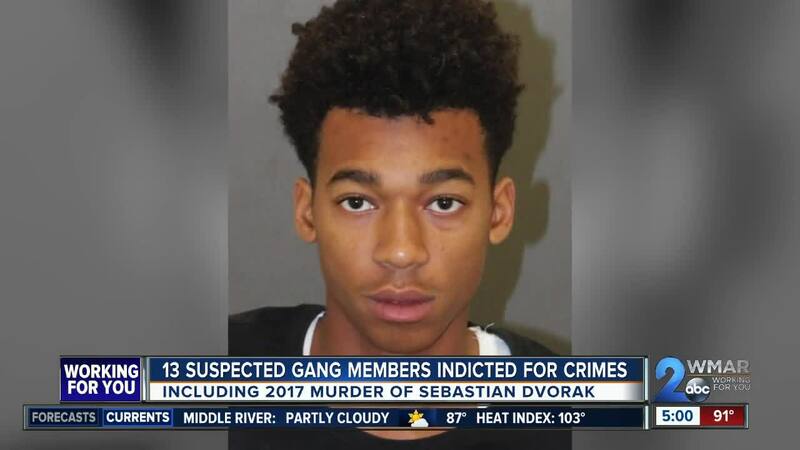 On Monday, a group of state and city officials gathered to announce that the following members of 500 L were allegedly responsible for the murder of Sebastian Dvorak. According to officials, Robert Lewis gave Malik Mungo a gun, and on June 13, 2017, Mungo and another individual robbed Dvorak with that gun in Canton. Dvorak was reportedly walking home after celebrating his 27th birthday when he was robbed and shot. Officials say surveillance footage was captured, and after it was released, members of the gang were trying to hide evidence, including the gun police say Mungo used in the shooting. Officials also say a member of the gang was involved in the death of Gerrod Greenwood in Baltimore County back in September of 2016. In September 2017, while the person charged for murdering Greenwood was on trial, members of 500 L got the information of one of the witnesses and posted on social media saying they were a "rat". In addition to the two murders, officials say the defendants also possessed and trafficked firearms. Police were able to monitor electronic communications between members and were sold a sawed-off shotgun while going undercover. A criminal indictment is just an accusation of wrongdoing and officials say the gang members are innocent until proven guilty.